The $8.9 million bridge was initially expected by Main Roads to cost at $7.1 million back in 2011 when work began. The cost of the bridge was covered by the WA Natural Disaster Relief and Recovery Arrangements, and the Natural Disaster State Contingency Fund. 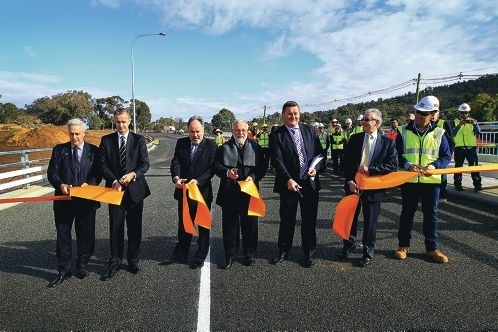 Darling Range MHR Tony Simpson’s office revealed that $7.1 million was the contract cost with Bocol Constructions to build the bridge and a further $1.8 million formed the total project cost, including design, planning and traffic management. The bridge’s accompanying pedestrian access way is yet to be concreted. The bridge replaces the temporary culvert that was installed, in just 18 days, after the timber Buckingham Bridge dating back to 1935, collapsed in the Kelmscott Roleystone bushfires. Work began on the 25m permanent structure late November of 2011. On Thursday, Mr Simpson thanked everyone involved and said managing to keep Brookton Highway open was a real credit to the team. Mr Simpson and Main Roads WA Commissioner Reece Waldock unveiled the name plaque for the bridge before the ribbon was cut to officially open Buckingham Bridge.